Freeman John Dyson FRS (lahir 15 Desember 1923; umur 95 tahun) adalah seorang fisikawan dan matematikawan teoretikal Amerika kelahiran Inggris, yang dikenal karena karyanya dalam elektordinamika kuantum, fisika benda padat, astronomi dan teknik nuklir. Ia merupakan profesor emeritus di Institute for Advanced Study, a Visitor of Ralston College, dan anggota the Board of Sponsors of the Bulletin of the Atomic Scientists. ^ Dyson, Freeman. "Alma Mater". Web of Stories. ^ "Obituary of Verena Huber-Dyson". Moles Farewell Tributes. 12 March 2016. Diarsipkan dari versi asli tanggal 12 December 2016. Diakses tanggal 12 December 2016. ^ "Professor Freeman Dyson FRS". London: Royal Society. Diarsipkan dari versi asli tanggal 2015-11-16. ^ "Scientist wins $1m religion prize". BBC News. 9 May 2000. Diakses tanggal 2010-05-02. ^ Freeman Dyson: Disturbing the universe, pg 131, "I had finally become an American ... The decision to abjure my allegiance to Queen Elizabeth might have been a difficult one, but the Queen's ministers made it easy for me." ^ "Ralston College". Diakses tanggal 30 January 2016. ^ Board of Sponsors | Bulletin of the Atomic Scientists Archived 20 April 2009 di Wayback Machine.. Bulletin of the Atomic Scientists. Retrieved 7 January 2013. 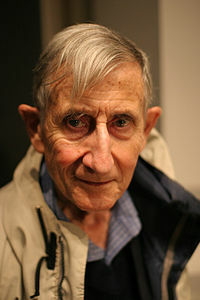 Wikimedia Commons memiliki media mengenai Freeman Dyson. Halaman ini terakhir diubah pada 23 November 2018, pukul 17.47.